Charity has always been a difficult thing for me. I don't mean that I don't want to help out, just that I want my help to go where it's really needed. I don't want to give a beggar money for drugs or alcohol. I don't want to donate to a charity that will use my money for administrators and advertising rather than the purpose I've donated for. I've learned my lesson with scams here in Mexico - people who drag their children around in dirty clothes showing all the gringos a copy of an ancient prescription and claiming they need money to fill it because the child is very sick. Who bothers to check the date on something like that? You just glance and reach in your wallet. Until you realize that you see the same person going door to door in the next village over with the same prescription and a different kid. Weekends are really special here when the town fills with people from Guadalajara who come out to enjoy a day at the lake. I usually get a run on people ringing the bell at my gate and asking for money for food. I've learned to keep my money and give them a bit of food. I often make a big pot of soup on Sundays anyway, so I keep some disposable bowls and plastic spoons on hand, just in case. That's why I was so happy to discover Kiva. The people at Kiva work with microfinancing institutions in 61 countries on five continents to provide loans to people who do not have access to the traditional banking systems. Yet loans made through Kiva have a 98.91% repayment rate! Kiva is funded through optional donations by lenders and through grants, foundations, and corporate sponsors. One hundred percent of every dollar I give goes toward funding loans. Most loans are $25, but many people make loans to the same person. The part I really like is that I get to choose exactly where my money is going to go. I choose what country I'm interested in loaning to and then go through the list of people from that country who are asking for loans. I get to see a picture of the person I'm considering loaning my money to and read about them, their lives, and what they need the money for. 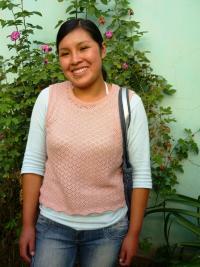 My current loan went to Jhanet, a 20 year old woman in Huancayo, Peru. Jhanet supports herself by making and selling aprons. She asked to borrow $1,125 to buy fabric and yarn and an industrial treadle sewing machine, since she lives without electricity. I liked the idea that her line of work is based on sewing, something similar to what I did - something I can understand. Actually, I loaned Jhanet $100, which she is due to pay back in August. This is her third loan through Kiva. She paid back the first two, so I feel pretty comfortable with this one. When I look up my loan, I can see who else kicked in for this loan, too. It makes me feel a part of a community that has come together to help this young woman. Somehow, the personal nature of this loan made me feel better than any donation I've ever made. And it's not even a real donation because I can get my money back after she repays the loan. I don't think there is a way to deduct it off my taxes, but who cares? For me, it is a donation. I don't want the money back. When she pays it off, I intend to loan the same money to someone else in need - and then kick in another $100 to loan out. If I do this every year, on the fifth year, I will be giving out $500 in loans. On the 10th year, $1000. That's a lot of $25 loans! Can you imagine what would happen if everyone who could afford it did the same thing? Kathy, thanks for the reminder that we need not feel obligated to give to every cause. How we give is a personal decision - not a tax break.